Our temperatures are starting to drop and our fall rains are kicking in periodically. It was supposed to rain today, so I set out harvesting a trailer load of gourds, fancy squash, and pumpkins which we sell to a local greenhouse, The Watering Can. I figure we have about three pickup truck loads of various pumpkins out there in the North garden as well as quite a few I’ve planted for pure seed in the Sand garden, a half a mile away and through the woods. My friend Dara popped in yesterday, just after I went out and harvested our Hopi Pale Grey squash. We didn’t have such big squash as usual this year but figured it was because the trees south and just over the fence from the patch have grown much bigger and are now shading the squash. So we’ll have to move the squash to a new location next year. We’ve still got a lot of tomatoes out in the garden and hope to get many picked this afternoon before it rains. 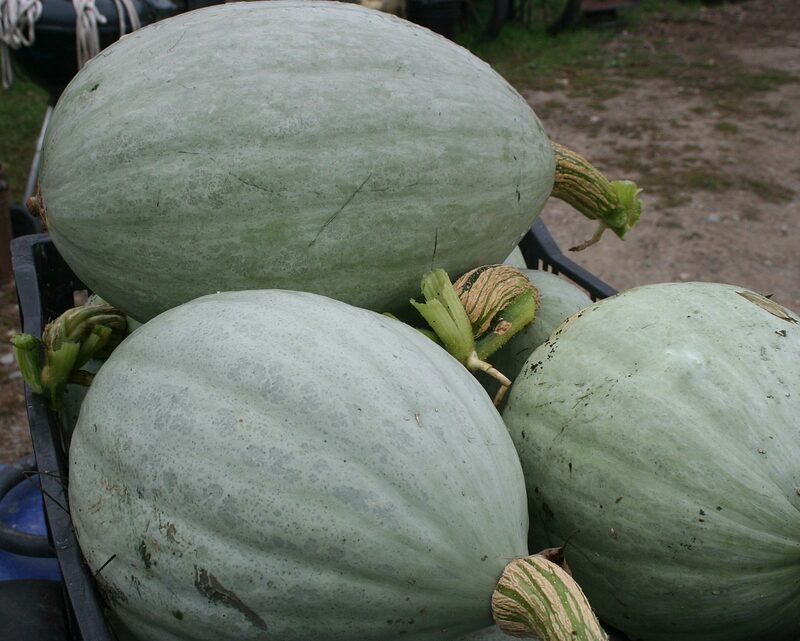 Our Hopi Pale Grey squash aren’t huge, like usual, but will taste great. We’ll move the patch to a sunnier location next year. Here’s a small trailer load of various squash, pumpkins, and gourds. Almost all of the corn which we’re saving for seed is in now. We thought we wouldn’t get a new variety, Spotted Big Horse, which I’d bought from Baker Creek. But surprise, we did get some ears! What fabulous and unusual colors too! Lots of lavender, purple, and flecked colors. We just love trying all the new varieties every year. Harvest time is like Christmas. 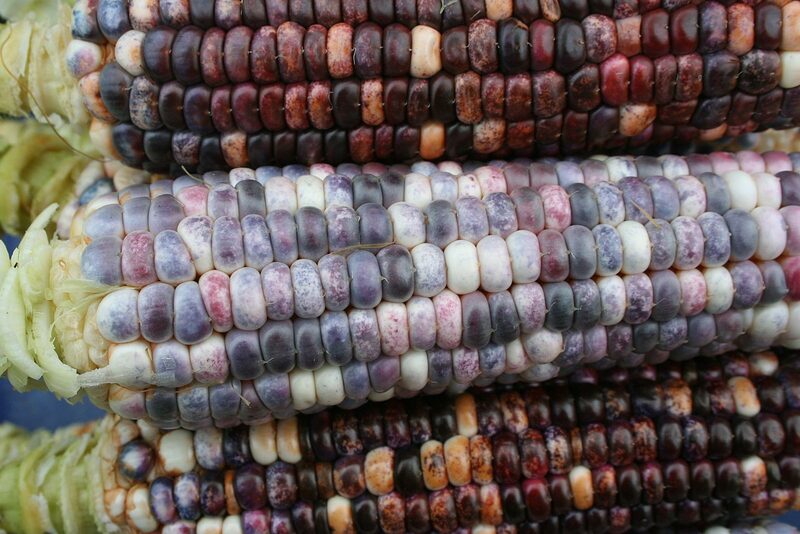 Isn’t Spotted Big Horse corn pretty? We’ll raise more next year. Is the Spotted Big Horse corn for eating, too? My very picky eater wife was sampling some Barry’s Crazy Cherry tomatoes I’d just picked and she said, “We have to grow these again next year.” I couldn’t agree more. They are prolific producers with great tomato flavor. 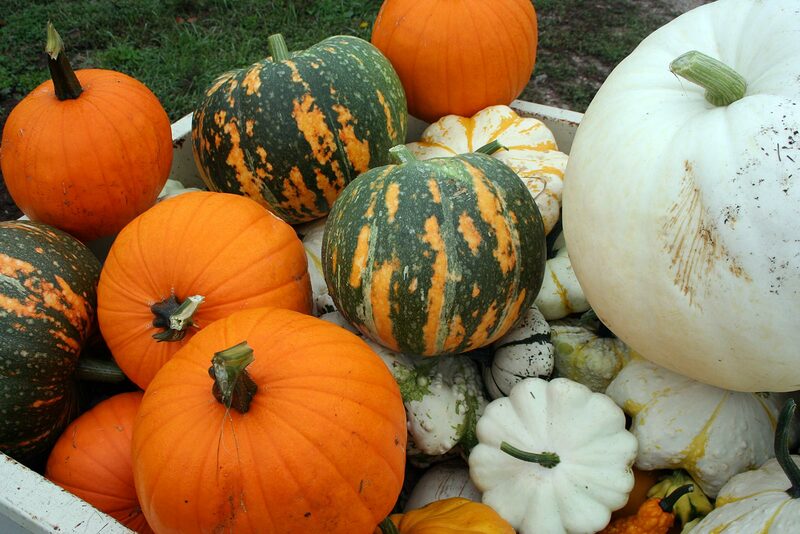 I now have a table full of Hopi Grey Squash–another great producer, but too invasive for our small raised beds. If there was a bush version of this I’d grab it in a second. We really love Barry’s Crazy Cherry too! And so hugely productive. Nope, Hopis are not for raised beds. The vines are very rampant, climbing trees and fences even. But boy do they make lots of wonderful squash. I am very happy that you are making your pictures available in the large format, Will cutting hay has been my screen saver for quite a while, so peace full looking out over the cut windrowed hay. David is going to have a great tree top view from his second story, will be almost like living in a tree house. I am really impressed with the progress that he is making on his cabin. Thanks for your Blog. You can thank Jessie for that! She does a great job formatting the blog. Yes, David will have a great view. I think we’ve all fantasized about living in a tree house and now he will! He’s really coming along but winter’s coming….. I never thought about adding pictures as screen savers. Your pictures are great and I added the trailor of pumpkins and the corn. I added the pumpkins as my screen saver too. Beautiful! Hmmm. Stands to reason, though. It would go with David’s favorite purple potatoes…. The pumpkin is Iran and is from Iran, originally. We first grew them last year and were really impressed. Not only are they beautiful and productive but taste great too! Our largest one weighs 45 pounds this year…with no special pruning or other care. The beavers aren’t talking yet but I’ll let you know when they are. I just love all the produce pictures that you share with us! Thank you! That corn today and the pumpkins are lovely. What is that smaller pumpkin that is green and orange stripes? So what are the beavers saying for winter this year? We are having pouring rain now so it’s time for indoor chores.